Insul-Fab offers a wide range of cutting and fabrication techniques, from traditional die cutting to state-of-the-art laser cutting, waterjet cutting and CNC machining and routing. In addition, we have expanded into three-dimensional part forming and molding, a capability which allows us to manufacture parts with enhanced form, fit and function. Each year, Insul-Fab makes significant capital investments in our production technologies to enhance our speed, precision and quality. But a fabricator is more than just equipment. Part design, prototyping and production begin with our experienced team of engineers who design in AutoCAD, Solidworks, and Master-Cam software. Read more about our most common capabilities below, or feel free to call or contact us to inquire about some of our unique capabilities, such as forming and techniques. 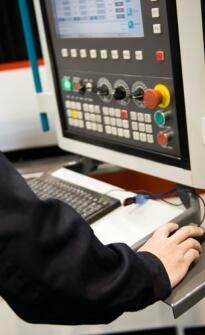 In-house tooling manufacture and maintenance ensures built-in precision throughout the part's lifecycle. Wide variety of presses and cutting equipment for optimum yield and efficiency. ISO 9001 and AS 9100 Quality system maintains process control and completed part verification. Die cutting with steel rule and engraved rotary dies produces tight tolerance parts from foam, plastics, fiberglass, rubber, foils and adhesives. Controlled by CNC interface, water jet and laser cutting are ideal methods for cutting a variety of materials without the need for tooling. Vacuum thermoforming and molding uses heat, vacuum draw and compression to form thermoplastics and polyolefin foams into custom, three dimensional profiles. CNC router cutting and machining is a fast, accurate method for trimming plastics, metals, and other rigid materials. In addition to supplying a full line of adhesives from 3M, Adchem and other leading manufacturers, Insul-Fab manufactures its own line of general purpose adhesives. Whether sewing, scoring, folding, tape placement or kitting, Insul-Fab provides a variety of finishing services to make customer parts ready for production line installation.